Today is the day! Samsung is about to unveil its next flagship device, the and possibly the Galaxy Watch too. It’s been a long time since the introduction of the first Gear device, and the fact is that despite the “old” was and still is a great device, there were several problems to overcome. So why not change the name? The Gear series is over. Galaxy Watch is the name of the next smartwatch. Let’s be clear, the new device won’t be that different from a design perspective. It’ll be a better revision of the old S3 and the variant. We worked really hard to make this possible, and we are finally announcing it, our first complete render is out and available on YouTube. We put a lot of effort to make this possible, hope you enjoy the work done and why not, let us know if you’d like to see other content like this on our network. 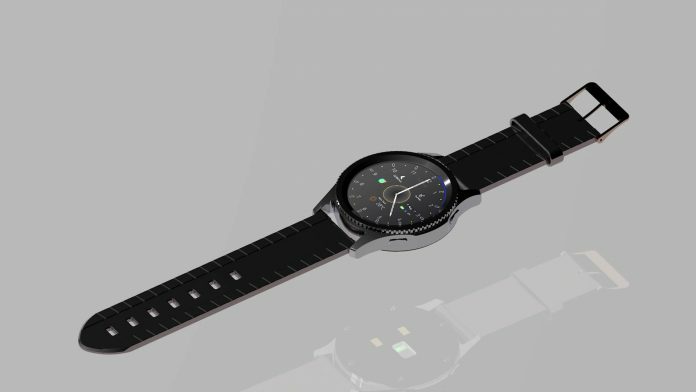 Galaxy Watch could be the game changer that the Korean house has always expected from its wearable devices, could this be the reason for the launch of a new range? The motivations that drove the company to this renewal are still unknown, but doesn’t really matter that much; today, we want to describe our idea. A minimal design but taken care of in every part, the appropriate combination of materials, the synchrony between body and software, these are distinctive features for us. Samsung Galaxy Gear recalls its predecessors, the ring distinguishes the smartwatch from the competitors and allows you to interact with applications by rotating it. The body of the smartwatch in different configurations, including matte black aluminum, stainless steel, bronze, copper, gold and other colors, is suitable to meet your needs and fulfill your personal expectations. The body line is a perfect compromise between harmony and movement of discordant surfaces, accompanied by strong impact proportions that suggest dynamism. At the back there is a sensor for monitoring heartbeat, oxygen saturation, and a new solution for measuring your body fat; the back cover includes wireless charging and ensures perfect ergonomics. We are testing out a new commenting system! Want to give a try?